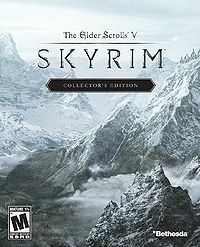 The Elder Scrolls V: Skyrim, the fifth game in the Elder Scrolls series, takes place in the province of Skyrim 200 years after the Oblivion Crisis. Dragons and their language play an integral role in the story. The High King of Skyrim has been murdered, triggering a civil war among the province's people, the Nords. Many Nords wish to secede from the empire, which has been declining in power since the fall of the Septim Dynasty 200 years earlier, while others believe the empire is the only way Skyrim can survive and thus still worth preserving. A prophecy foretold by the Elder Scrolls is fully realized by this last event; dragons have returned to the land, and the Nordic god Alduin rises to consume the world. The player character is the last Dovahkiin (or "dragonborn"), mortals who are born with the soul of a dragon and can speak their language. This prophecy is also spelled out on Alduin's Wall, a stone wall at Sky Haven Temple, the secret hidden refuge of the last of the Blades. New gameplay features introduced include dual-wielding (assigning a weapon or spell to each hand, putting a spell in both hands makes an enhanced version of the spell), and new weapons that can be smithed at a forge from crafting materials. Unique finishing attacks are used for each weapon. Players can challenge (and be challenged by) certain NPCs to hand-to-hand brawls. Stamina can be expended quickly by choosing to "sprint", and backward movement is slower than forward movement. Character levels are no longer gained after a specific number of skill increases; rather it varies according to the skill level attained. The higher the skill level attained, the more progress is awarded towards the next character level. Therefore, faster player leveling can be achieved by focusing on increasing developed skills. Additionally, the lack of a class system eliminates the distinction between Major and Minor skills present in previous games; all skills provide equal leveling progress and will increase at the same rates for all characters upon creation. However, activating a Guardian Stone will speed the increase of its governed skills or give you a special power Gaining a level also grants the player level-specific skill abilities and an increase in the attribute of the player's choosing. Each skill has a perk tree; upon gaining a level a player also gains a single perk 'point'. The point may be used at the time of leveling, or saved until the player sees fit to use it. Leveling above level 50 happens at a much decreased rate. Level-scaling is used, but is more comparable to the system in Fallout 3 than the one in Oblivion. There are ten playable races, the player character is still very customizable, and beards and customizable body features are among the new options available. The Sneak icon appears as an eye symbol on the crosshair as in Oblivion, and now varies depending on NPCs' level of awareness as in Fallout 3. A slightly open eye means the enemy is alert and knows someone is hiding, a medium-open eye means the enemy is actively searching, and an open eye means the enemy has found the player. A single Crafting skill is associated with each of the three main skill groups: Enchanting for Magic, Smithing for Combat, and Alchemy for Stealth. In common with Morrowind and Oblivion, Vampirism is present in Skyrim, and it is possible for the player to become infected and turn into a vampire. Players can also contract Lycanthropy and turn into Werewolves. The main quest takes approximately 30 hours to complete in addition to the hundreds of hours of side quests to be completed. Player/NPC interactions have been improved. Conversations between the player and NPCs do not freeze the rest of the game world, and the NPCs continue their activities while occasionally glancing at the player. A new system has been developed for quests, known as the Radiant System. NPCs react to the player's actions in new ways, such as fighting over possession of an item dropped by the player or attempting to return it to the player. The shop of a killed NPC may be inherited by another NPC, who may then offer the items/quests of the first. The player may also marry an NPC of either gender, and if they own a house, their spouse can live in it with them. The player's actions also directly affect side quest creation, as well as altering parts of quests. NPCs now visibly perform the tasks suited to their roles (i.e. a cook will be cooking) unlike previous games where they just stood still. The faces of NPCs have been extensively overhauled and show distinct differences between races and more varied emotional expressions. A large set of example character images was posted on Bethesda's Blog on August 24. The images can be found here. NPCs are voiced by a cast of more than 70 actors. Christopher Plummer plays Arngeir, a powerful Greybeard elder; Max Von Sydow plays Esbern, a chronicler and agent of the Blades who has survived in hiding; Joan Allen is Delphine, one of the last remaining members of the Blades, and Lynda Carter returns as a Nord hero named Gormlaith Golden-Hilt. The game also features Michael Hogan as General Tullius, Vladimir Kulich as Nordic Jarl Ulfric Stormcloak, and Claudia Christian as Tullius's chief lieutenant, Legate Rikke. Other voice actors include Diane Louise Salinger, Renee Victor and George Coe. Click here for the full image of Alduin's Wall, featured in the teaser trailer. Five large cities, comparatively larger than those in Oblivion, are available to explore (and to be attacked from above by dragons), along with a wider variety of caves and subterranean areas. The main five cities are walled and located in separate worlds to conserve memory (like Oblivion) but the 4 minor cities and 7 towns will be open (like Morrowind). Fast-traveling to locations already discovered has returned. Cooking, farming, wood-cutting, and mining, in addition to weapon-smithing, can be done in different towns. Children are also featured in the game. New factions include the Companions (mercenary guild), the College of Winterhold (mages guild), and the Stormcloaks (rebellion). The Thieves Guild and the Dark Brotherhood, Blades and Imperial Legion return as joinable factions. The 150+ dungeons in the game were created by a team of eight, whereas Oblivion's dungeons were all created by one designer. Upon a giant mountain, the Throat of the World houses the home of the Greybeards, High Hrothgar, at the head of 7,000 steps. Skyrim features horses as mounts. Hostile creatures include: spiders, trolls, ice wraiths, zombies, sabre-toothed cats, wolves, daedra, skeletons, draugr and dragons. Some creatures such as mammoths and giants are non-hostile until the player moves too close to them. "Dynamic shadows" are used and snow falls and accumulates dynamically. Plants move more believably with the wind, and the water in the game actually flows along a course. Skyrim, like its predecessors, features a wide variety of weapons and armor of varying materials and quality, as well as many unique weapons, armor pieces, and tools to discover. Weapons and armor no longer degrade with use. Instead, the Smithing skill is used to craft new equipment and improve weapons and armor using raw materials from the new mining and leather working activities. Nearly any piece of equipment (even powerful Daedric artifacts) can be enhanced, and a skilled smith can vastly improve the quality of their gear. Enchanting allows the player to further enhance their items with magic. Enchanters can expend a Soul Gem to add magical effects to any weapon, armor, clothing, or jewelry that does not already contain an enchantment. New enchanting effects can be learned by disenchanting magic items found in the world. The inventory menu now includes a preview with the ability to rotate and view any item you are carrying. This can be used to admire your gear and see what an item looks like without the need to drop it into the world, and some objects must be closely examined this way for clues on how to proceed in certain quests. The game's soundtrack has been composed by Jeremy Soule, who was also responsible for the music in Morrowind and Oblivion. Although much of the music is new, at least one track featured in preview videos has appeared before: the track at the start of this demo is known as Rise to Reality or Silt Sunrise in Morrowind, and Through the Valleys in Oblivion. The soundtrack is being released as a four-disc set through DirectSong. The game was released on November 11, 2011, worldwide on the Xbox 360, PS3, and PC platforms rated as M for mature, and could be pre-ordered from several online retailers, such as GameStop and Amazon. It uses an all-new graphics/gameplay engine called the "Creation Engine" that uses some of the elements from Oblivion and Fallout 3/New Vegas, but new talent was also brought in to improve on the characters and animation of previous Bethesda titles. The game editor, previously called the Construction Set and now known as the Creation Kit, works in a similar way to previous versions. It was confirmed that the game will be integrated with the Steamworks distribution system. The game is rated M (Mature) in North America, but is provisionally rated 15 in the UK  and MA15+ in Australia. There are several pieces of downloadable content (DLC). The first two major DLCs were commissioned to be exclusive to the Xbox 360 for 30 days, after which they were made available for the PC. Due to issues with the performance of the PS3, none of the content released in 2012 was made available for download until February of the following year. Elderscrolls.com: official content; media, downloads, community content, etc. ^ "Gamescom 2011: The Elder Scrolls V: Skyrim Preview - Venturing Off The Beaten Path", 25 August 2011, last accessed 12 September 2011. This page was last modified on 21 October 2018, at 20:41.